As Bosch themselves will gladly tell you themselves, when it comes to their ovens, they’re not solely concerned with how well they cook things. They’re also interested in exactly how long they will last in the home, and as a result are built of only the finest and most stable materials, in addition to being subjected to rigorous stress tests. With Bosch ovens, you know exactly what you’re in for, and that is an oven that is built to endure for the long term. 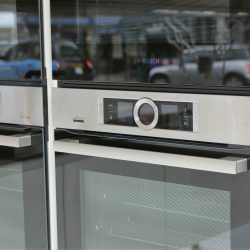 Their range of ovens is also innovative in another way; how they fit into a kitchen environment. Their bread and butter are built-in ovens rather then freestanding ones, helping to maximise free space in a way that keeps things as free of clutter as possible (and in a way that is eye-pleasing and stylish, to boot). The range includes a number of built-in ovens in both singular compartment and double compartment capacities, and ovens with a variety of functions. If you want a straight up single compartment oven that just does what it needs to, Bosch have you covered; if you want a double compartment, multi-function oven with added Steam-based functions, Bosch has you covered there too. They even offer ultra-compact versions of their ovens, for the kitchens out there where space is truly at a surplus. That’s to say nothing of how innovate some of the features their ovens offer are, too. From 4D Hot Air functions that distribute heat as evenly as possible around their ovens, to BoschAssist functions that contain automatic heat settings optimal for a number of dishes, Bosch ovens are as bleeding edge as they are stylish. And they are extremely stylish; all their ovens feature sleek, uniform designs, and are available in black, white, or even brushed steel finishes.